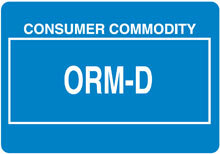 ORM-D shipping labels. The abbreviation for Other Regulated Material - Class D. An ORM-D material is one which may be subject to DOT regulations but which presents a limited transportation hazard due to its form, quantity, and packaging. 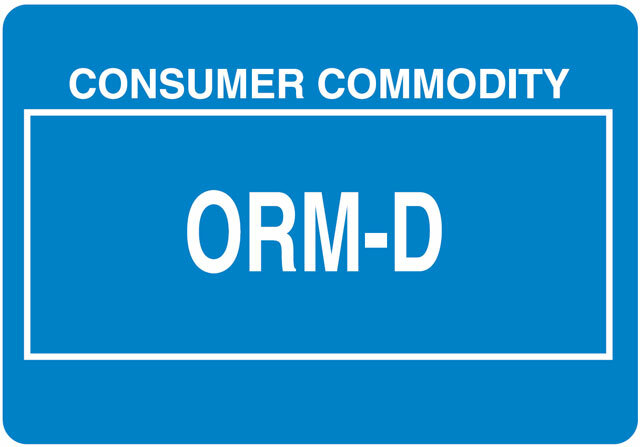 ORM-D materials are materials for which exceptions have been provided in the Hazardous Materials Regulations and which are consumer commodities. Specific quantity and packaging details required for ORM-D classification are given in the Regulations. 3" x 5" on Semi Gloss. 500 per roll. 6 rolls/case. To bring you our best price minimum purchasing requirements may change without notice. Please call for the most up-to-date pricing on this item. 2 1/4" x 1 3/8" - 1000 per roll. 6 rolls/case. To bring you our best price minimum purchasing requirements may change without notice. Please call for the most up-to-date pricing on this item.